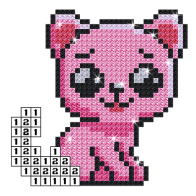 💎Diamond Pixel Coloring Book is free relaxing application for children and adults to color by number and have fun. Relax and reduce stress using coloring by numer. Color by number – free coloring games – helps practice concentration and also have a great time! In the coloring book you will find beautiful 💎diamond pixel pictures. It’s really easy, choose suitable color and click to right place. Remember – no draw – just color tap. If you make a mistake you can undo your move. Diamond Pixel Coloring Book can be played anytime and anywhere! All settings and controls are easy to use for adults and children – drawing is as easy as playing in a sandbox. – 100 + animated diamond artworks to choose from. Every week we add new pixel pictures to coloring book! Choose your favorite pictures with animals 🐱 🐩, flowers 🌷🌼 🌹, hearts 💚 and many more. Share your artworks with friends on Instagram or Facebook! If you lack some pictures email us, we’ll add it to the update. In case of any problems with the effect of Diamond Pixel , instead of giving us the negative opinion, please send us an e-mail and review briefly the problem. It will help us to solve it in the next updates of app. Diamond Pixel Coloring Book is free but contains ads in settings of the wallpaper and inside app. Revenue from advertising will help us to create new attractive wallpapers and applications. All permissions are required only for advertising and are supported by trusted vendors.